The Black Marlin is found in the tropical Indo-Pacific oceans and an extraordinary trophy for any angler. 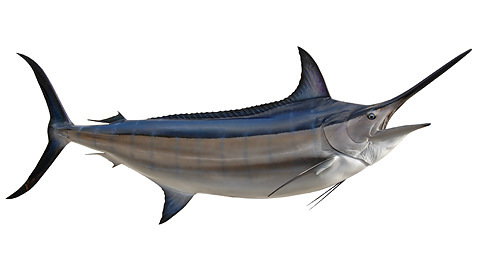 Known as the Pearl of the Ocean, the Black Marlin (Makaira indica) is a much sought after game fish. It is a strong, fast pelagic species highly prized by sport fishermen. Elegant, strong, and with a great deal of stamina, the Black Marlin fish offers an unforgettable fight. The Black Marlin is a species of marlin found in tropical and subtropical Indo-Pacific oceans. It will often be found close to the surface. It is one of the largest marlins and bony fish and is one of the fastest fish on earth reaching speeds up to 80 mph (128km/h). The Black Marlin has a dark blue dorsal side, a silvery white belly, and faint blue vertical stripes running down the sides. The first dorsal fin is blackish to dark blue, while the other fins are dark brown, sporadically with blue tinges. A specimen may have anywhere between 39 and 50 dorsal soft rays. Males may reach a length of 4.65 m and weight of 750 kilograms, females are generally much larger. The Black Marlin is the only marlin with non-retractable fins. Like all billfish, the species has a distinctive stretched out sword-like upper jaw. Its dorsal fin is proportionately the lowest of any billfish, standing less than 50 percent of the fish’s body height. Scientists are yet to determine how long a member of this species lives. Needless to say, this is an impressive species, even if caught and released it can still make an extraordinary fish trophy that will be proudly showcased by the lucky one reeling it in.